My Daily Art Display today is, like my last offering, another painting depicting a scene from the Bible. 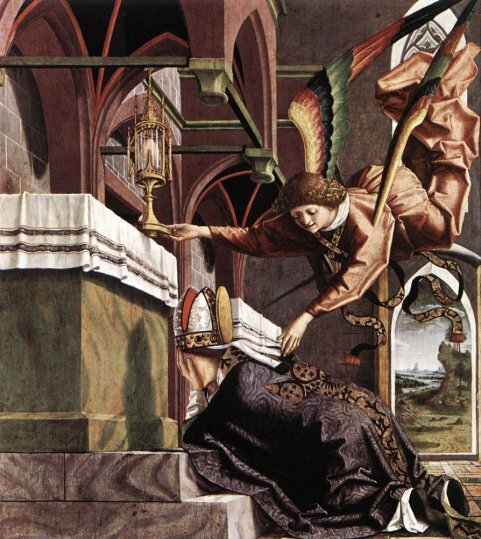 The scene is The Annunciation and has featured in paintings by many of the Renaissance Masters. 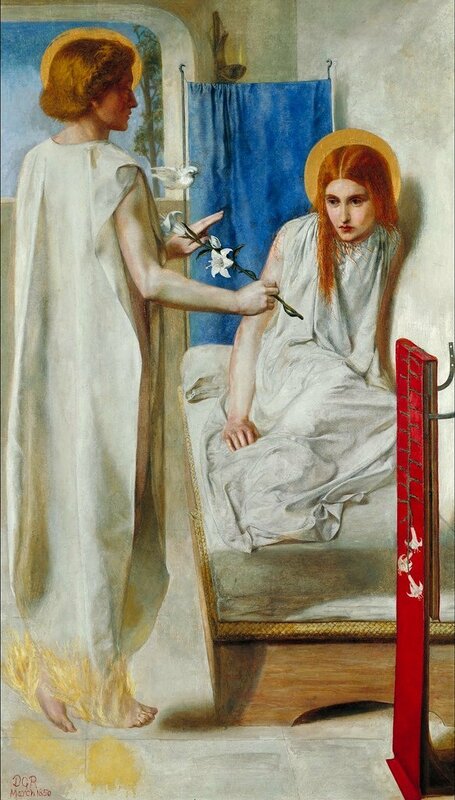 However this painting by the Pre-Raphaelite artist Dante Rossetti has some subtle differences from these earlier works by the likes of Fra Angelico, Raphaello Santi, El Greco, van Eyck and Botticelli. The painting I am featuring today is entitled The Annunciation which Rossetti painted in 1850. That was not its original title given to it by the artist, Gabriel Rossetti. 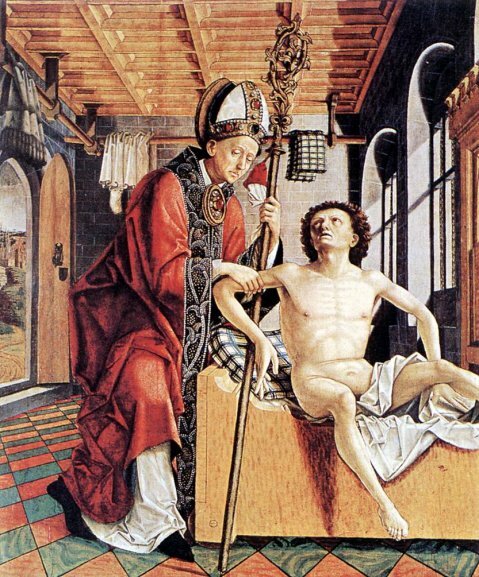 He had originally decided to call the painting Ecce Ancilla Domini meaning “behold the handmaid of the Lord” but at the last moment changed his mind. In the painting, Rossetti has just used the three primary colours, red, blue and yellow along with white. The use of these colours by the artist is symbolic. We have white for feminine purity, blue for the Virgin Mary, red for the Passion of Christ and yellow or gold which symbolises holiness. There are other things in the painting which are symbolic. The Angel Gabriel holds a lily and in the foreground we see a red cloth on to which we can see that Mary has embroidered white lilies. Maybe this signifies the young girl’s decision to live a very pure life. Mary and her mother, St Anne, can be seen embroidering that very cloth in Rossetti’s painting The Girlhood of Mary Virgin which he painted a year earlier. Lilies symbolize purity, chastity, and innocence and white lilies represent the purity of the Virgin Mary. In most paintings of the Annunciation we see the Angel Gabriel presenting Mary with a white lily when he announced to her that she would give birth to the Son of God. The setting Rossetti has given this scene is very unusual. In Renaissance paintings of The Annunciation we look at settings which are sumptuous. Tapestries and heavy velvet curtains often abound. Light frequently can be seen entering the scene through exquisite stained glass windows lighting up elaborate furnishings and floor coverings. Rossetti chose not to go down that line. As we look upon the scene the first thing that strikes us is the claustrophobic compactness of Mary’s room. It could almost be termed minimalistic in its accoutrements. Look at the window opening on the back wall. There was no attempt by Rossetti to give a feeling of depth to this painting by depicting a town somewhere in the far distance. The window opening is plain and uncovered and through it we just see part of a solitary tree against a blue sky, the colour of which mirrors that of the colour of the screen at the end of Mary’s bed. In most depictions of this scene we see Mary dressed in blue robes quietly and in some cases joyously receiving the news that she will give birth to the Christ child. However Rossetti has depicted Mary’s mood differently. We see Mary dressed in a white shift dress shrinking back from the Angel Gabriel. Rossetti has added the colour blue which is associated with the Virgin Mary in the form of a blue cloth screen hanging behind her. Rossetti has also included a dove which embodies the Holy Spirit. 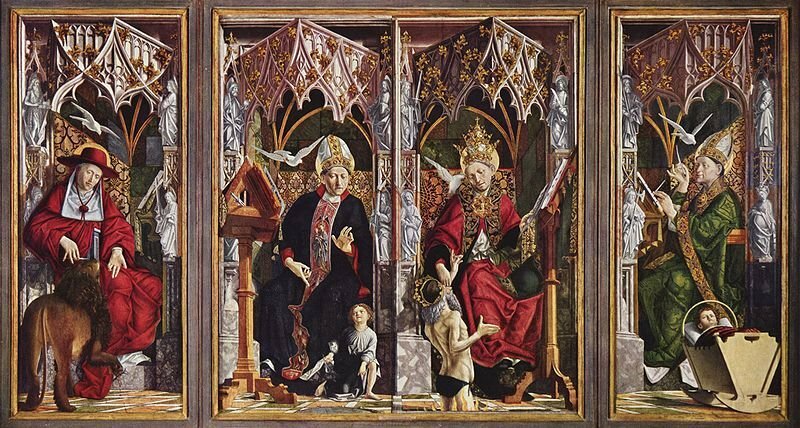 He has depicted the golden-haired Angel Gabriel without wings, which was the norm for Annunciation paintings. Gabriel’s face is in shade and his facial features are almost hidden from us. He can be seen in this painting hovering just above the floor with flames all around his feet. I wonder if I am just imagining it but it looks as if he is pointing the lily stem at Mary’s womb. It is little wonder that the combination of his words and this action make the young girl almost cower and recoil against her bedroom wall. I believe a number of the “standard” Annunciation paintings were meant to inspire us to lead a “good” life and for that reason we see the Virgin Mary delighted to be given the role as Mother of God. The “standard” depiction of Mary with her happy smiling face leads us to believe that leading a pure and holy life will give us similar pleasure. 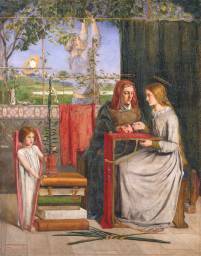 However Rossetti’s depiction of the Annunciation questions Mary’s happiness to accept her future role in life. It is a role that will take away many of the pleasures a young girl would be looking forward to enjoying as she enters adulthood. I suppose how you look at the painting and how you interpret what you see will depend on your religious belief.